Welcome to the Math Salamanders 2nd Grade Measurement Worksheets. 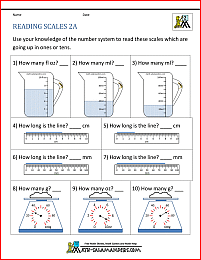 Here you will find our range of Second Grade math sheets to help your child with their measuring and reading scales. At Second Grade, children love to explore Math with fun Math activities and games. Children will enjoy completing these Second Grade Math games and Math worksheets printable whilst learning at the same time. During Second Grade, the Math work extends to place value up to 1000. Children practice counting in ones, tens and hundreds from different starting points. They build on their understanding of addition and subtraction and develop quick recall of basic addition and subtraction facts. Their written methods in addition and subtraction extends into using 3 digits. At 2nd Grade children also learn to solve simple addition and subtraction problems and work out the answers mentally or on paper. Children are also introduced to mutiplication and division at this stage, and also the fraction 'half'. They learn their multiplication table up to 5x5. The free printable Second Grade Math Worksheets, Games and other free Grade 2 Math sheets will help your child to achieve their Elementary Math benchmark set out by Achieve, Inc. In the UK, 2nd Grade is equivalent to Year 3. Here you will find a range of measurement worksheets to help your child learn to read scales and understand some of the ways things can be measured. These sheets have also been designed to help support children's understanding of the number system. All the 2nd grade measurement worksheets in this section support Elementary Math Benchmarks for 2nd Grade. 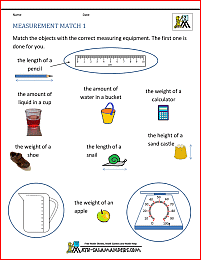 This sheet will help your child understand the equipment we use to measure different things. 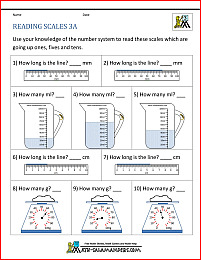 If these 2nd grade Measurement worksheets are not at the right level for you, try some of our easier first grade measuring worksheets. If these first grade Measurement worksheets are not at the right level for you, try some of our harder 3rd grade measuring worksheets. Here you will find our selection of number line worksheets for 2nd grade. The following sheets involve correctly placing numbers on a number line. understand place value to 1000. All the sheets in this section will help your child with their understanding of 3 digit numbers. These sheets will support your child with their time learning.